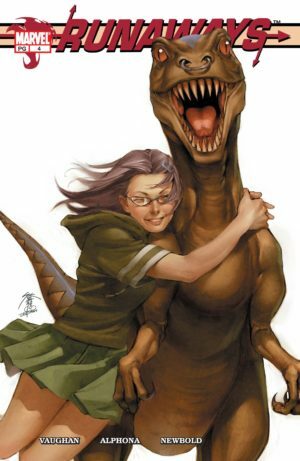 The definitive, chronological, and up-to-date guide on collecting Runaways comic books via omnibuses, hardcovers, and trade paperback graphic novels. A part of Crushing Krisis’s Crushing Comics. Last updated November 2018 with titles scheduled for release through July 2019. 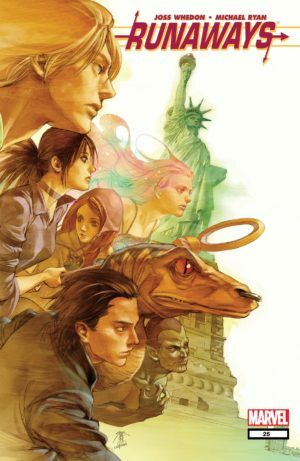 The Runaways are a unique gift to the Marvel Universe from author Brian K. Vaughan, who would later write such modern classics of the medium as Y: The Last Man, Ex Machina, and Saga. The Runaways are are a team that are not a team and a heroes that don’t mean to be heroes. They’re just kids – regular, average kids. They aren’t even friends with each other. Instead, they are thrust together by the insane circumstance of their parent’s plotting. Some of them discover inherent powers they were never aware of, while others inherit special artifacts or technology, but they are kids first and super-powered teens second. Over time that initial direction has faded, new cast members have been added, and the Runaways have begun to make more connections across the Marvel Universe. Yet, part of the continuing gift of the Runaways – and part of why their new connections are so interesting – is that they never needed to be in the Marvel Universe in order to exist. Vaughan could have just as easily penned them as a creator-owned title. It’s surprising he did not, as Marvel was long since out of the game of creating new teams of characters wholesale without attaching them to another franchise. As a result, the Runaways cast offers something magical every time they do bump up against a Marvel stalwart. Those characters seem more fantastical to the Runaways than they do to us as readers, which in turn helps us to see them with new eyes. Over time, these random characters thrust together and forced to be friends and occasional heroes have transformed into Marvel’s most-modern family – a family of that chose each other, and will support each other until the end. 2013 – 2015: In Marvel Now! 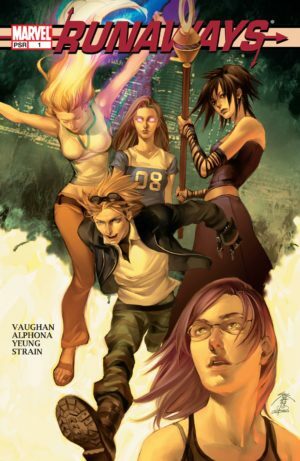 The original 18-issue Runaways series written entirely by Brian K. Vaughan. This was the debut of the core cast of Nico Minoru, Karolina Dean, Molly Hayes, Chase Stein, Alex Wilder, and Gertrude Yorkes. It tells a complete story with a definitive end. Collects Runaways (2003) #1-18, Runaways (2005) #1-24, and Free Comic Book Day 2006. If you are buying regular TPB or the pocket-sized digest versions of the series, be careful to get the right edition! TPBs will be listed with a height of around 10″ – digests are only about 7.4″. Also, digest versions were released later. Also available in hardcover and digest version. Reprinted in 2017 as ISBN 978-1-302-90500-2. Issues #11-12 also collected in Cloak and Dagger: Runaways and Reversals. Also available in hardcover and digest version. Reprinted in 2017 as ISBN 978-1-302-90501-9. This 30-issue second series features the cast of Nico Minoru, Karolina Dean, Molly Hayes, Chase Stein, Gertrude Yorkes, and Victor Mancha. Creator Brian K. Vaughan wrote it through issue #24, at which point Buffy The Vampire Slayer creator Joss Whedon took over for a final arc. Also in this period, the Runaways participated in two of Marvel’s line-wide events – Civil War and Secret Invasion. Civil War. In both cases, the group teamed up with the Young Avengers. Civil War occurs in the gap between Vaughan and Whedon. Secret Invasion occurs after the end of Whedon’s run. Also available in hardcover and digest version. Reprinted in 2017 as ISBN 978-1302908706. Issues #9-12 also collected in Cloak and Dagger: Runaways and Reversals. Free Comic Book Day 2006: Not collected with these original collections. Occurs around #13. Also available in hardcover and digest version. Reprinted in 2017 as ISBN 978-1302908713. Also available in hardcover and digest version. Reprinted in 2017 as ISBN 978-1302908720. Collects the four-issue mini-series. Occurs between #21-22. Reprinted in 2016. See Marvel Universe Events for more information. 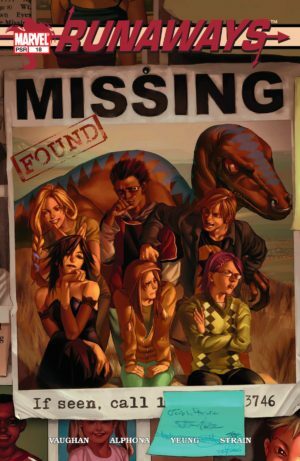 Runaways Saga: A one-shot issue recapping to the story to this point, but it happens to contain four pages of original story as a framing device. I’m not certain if they have been collected. Also available in hardcover and digest version. Note that there are two different dust jackets for the hardcover – a traditional one, and one that is more bookstore oriented with Joss Whedon’s name featured prominently. Reprinted in 2018 as ISBN 978-1302908867. Collects the three-issue series. See Marvel Universe Events for more information. This 14-issue third series features the cast of Nico Minoru, Karolina Dean, Molly Hayes, Chase Stein, Victor Mancha, Xavin, and Klara Prast. It was launched with Terry Moore, with Kathryn Immonen writing the final arc. Collects Mystic Arcana: Sister Grimm, Runaways (2008) #1-14, Breaking Into Comics The Marvel Way, and What if the Runaways became the Young Avengers? Also available in hardcover and digest version. Reprinted in 2018 as ISBN 978-1302909109. Also available in hardcover and digest version. Reprinted in 2018 as ISBN 978-1302909116. The Heroic Age was a period of Marvel Comics where its titles focused on returning their teams to more straight-forward, heroic themes. Without their own title, the Runaways were relegated to just a handful of guest appearances. 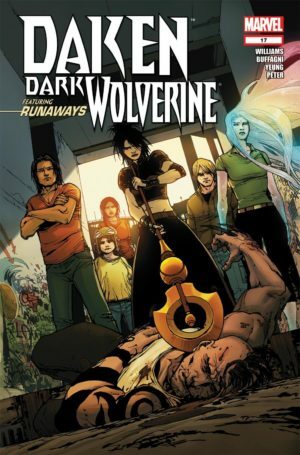 Daken #17-19: The Runaways appear here prior to some of them being collected into the cast of Avengers Academy. Collected in Pride Comes Before the Fall hardcover and paperback. Alex Wilder appears in Iron Man Legacy #7-8 & 10-11. It’s not clear to me if this story is set in current continuity; Alex’s appearance would suggest it is not. The Runaways appear in Avengers Academy #27-28, with some making a brief appearance in #39. The Runaways did not have their own title in this period, and make scant few appearances – with the singular exception of Nico Minoru. Both Nico and Chase appear in Avengers Arena, but Nico is very much a featured star of the book along with X-23 and Hazmat. 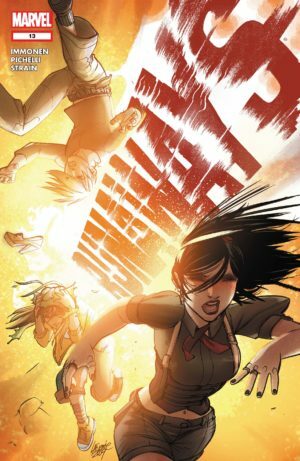 As a result, Nico becomes the first Runaways character to truly break out away from the rest of the group – though that won’t be felt until Marvel’s next era of publishing. Nico Minoru & Chase Stein appear throughout Avengers Arena and its follow-up, Avengers Undercover. Other Runaways make a guest appearance in Avengers Arena #13 and several brief times in Avengers Undercover (#1, 4, and 10). Molly Hayes appears in Infinity: The Hunt #1 (see Marvel Universe Events: Infinity for more information) and briefly in X-Men Legacy #23. Victor Mancha stars throughout Avengers A.I. and briefly appears in Ant-Man (2015) #1. Secret Wars featured an alternate-reality Runways mini-series with Molly Hayes as the only recognizable member. 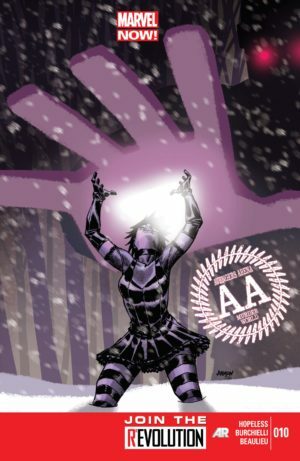 Also, Nico Minoru starred in A-Force, Vol. 0, in which Karolina Dean appears in #1. Nico also appears in Inferno #1 and Battleworld #2. See Marvel Universe Events: Secret Wars for more information. The Runaways are missing in action as of the start of All-New, All-Different Marvel in 2016 with the exception of Nico, who anchors A-Force – an all-woman super team. Victor and Alex also turn up as guest-stars in this period. Nico Minoru continues to star in a re-launched A-Force beginning in issue #4 and in the A-Force preview in Avengers #0, collected in A-Force, Vol. 1 and A-Force, Vol. 2. Karolina appears briefly in #1. Victor Mancha plays a pivotal, tragic role in The Vision, appearing in #8-9 and #11-12 in Vision, Vol. 2. Alex Wilder appears in Power Man and Iron Fist (2016) #10-15 – see Luke Cage or Iron Fist. The Runaways relaunched in their own ongoing in the Fall of 2017 – just in time for Marvel’s new Legacy era. This version of the team somewhat ages up the characters to reflect their off-camera experiences in the Marvel Universe in the past few eras. It begins with Nico and Chase, but the scope gradually widens to discover the other members – adding Karolina in #3 and Molly in #4. Check Amazon for Marvel’s newest Runaways titles. Love your Site!!! I’m on it multiple times a week! I find no mention of Runaways Complete Collection Vol. 4 on this list which collects Runaways Vol.3 (2008) 1-14, Mystic Arcana: Sister Grimm, What If the Runaways became the Young Avengers? and Breaking into Comics the Marvel Way. I have no idea how I missed that one … and I really missed it, I had no idea it even existed! I just added it to the page, thanks to your tip.